The geographic coordinates of Haskovo are 41° 56' north, 25° 35' east. It comprises parts of the Thracian valley along the river Maritsa (Evros, Meriç). It is 170 km away from the Black Sea and 140 km from the Aegean Sea /air distance/. The geographic location of the town is very strategic, because the International road Vienna-Belgrade-Sofia-Istanbul-Southern Asia passes through it. Haskovo’s relief is hilly and represents a Northern extension of the Eastern part of the Rhodope Mountains. The lowest point of the province’s relief is the valley of the Maritsa River /52 m near Svilengrad/. The altitude is 180 m. The climate is temperate and is conditioned by the continental influence from the North and the Mediterranean from the South. The proximity to the Aegean Sea, the comparatively low crests of the Eastern Rhodope Mountains and the unimpeded penetration of warmer air streams along the Maritsa valley are good conditions for the growing of the traditional for the region agricultural crops – oriental tobacco, cotton, pea-nuts, vineyards, variety of vegetables. 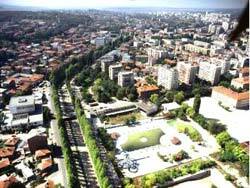 According to the permanent address registration the population of the town of Haskovo is 96 194. According to the current address registration the population is 81 449.